It is very possible that there are several dozens, if not hundreds, of bands called Pendulum all over the huge world. This is a beautiful, some might even say romantic, word that has some inner attractiveness. Nowadays, there is an Australian based in the UK, consisting of six people led by Rob Swire and named Pendulum. One might say, that at the present moment, this very ensemble is the most successful of all those bearing this title. Fame descended all over these young men after the release of their debut effort Hold Your Colour (2005). Introducing themselves as a drum and bass performers, Pendulum began mixing genres audaciously. Yet whatever they added to their music, it remained dance, energetic material with strong rhythm lines and variegated synths. In three years, Pendulum presented their sophomore long player, quite an arguable work named In Silico. Many said it had too much rock-music in it. In 2010, the musicians released their third full-length effort, Immersion. In many parts, this is a correction of the past errors and demonstration of Pendulum’s strongest sides. 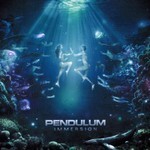 Lasting almost seventy minutes, Immersion is more like a collection of Pendulum’s songs taken from their separate albums rather than one genuine studio work. Indeed, some tracks here are so much different from the rest of the bulk that they do look like strangers on this CD. Take, for instance, an impressive and aggressive piece Self Vs Self recorded in collaboration with the Swedish extreme rockers In Flames. What is melodic-death metal stuff doing here, amidst the primarily electronic music? Yet this is rather a minor misjudgment allowed by the musicians than a distinctive feature of the whole pretty good album. The best, probably, song here comes in quite early. This is track number three, Watercolour, stylistically similar to the In Silico material. It has those very powerful, even threatening drums. Since Pendulum are eager to try a bit of everything, they could not resist doing something in the vein of The Prodigy. Actually, for this purpose, the band invited Liam Howelett. The song they made together, Immunize, has a lot in common with what the legends of heavy dance music used to do in the second half of the nineties. This was worth the efforts. Nevertheless, electronic music here is used much wider than guitar, which forms the main difference between the second and the third studio attempts. And this is one more time proved by the closing of Immersion. Unlike In Silico that was concluded by an explosive and heavy rock piece, this one ends in Encoder, a retro pop-music song taking us back to the eighties. Now, if you look closely you will be able to single out those tracks that could be extracted easily without making harm to the album. In fact, this would make Immersion sound like a more unified, conceptual piece. Yet this result was not a goal the musicians of Pendulum pursued. They carry on experimenting and changing from album to album. When studio records are executed on the similar level of performance, yet feature separate stylistic influences, it is immensely difficult to compare them. Probably, Immersion will fail to walk the same path of glory the debut Hold Your Colours did. But this is because the third CD does not the beckoning of the first work and can not raise that curiosity that the listeners shared when meeting Hold Your Colours five years ago. However, a strong impression rises that Pendulum so far are only seeking their place in the vast universe of music. For these five years. They have released three extremely different albums, which means the guys are full of ideas, energy and desire to create on and on. And this paints their future optimistic colors.